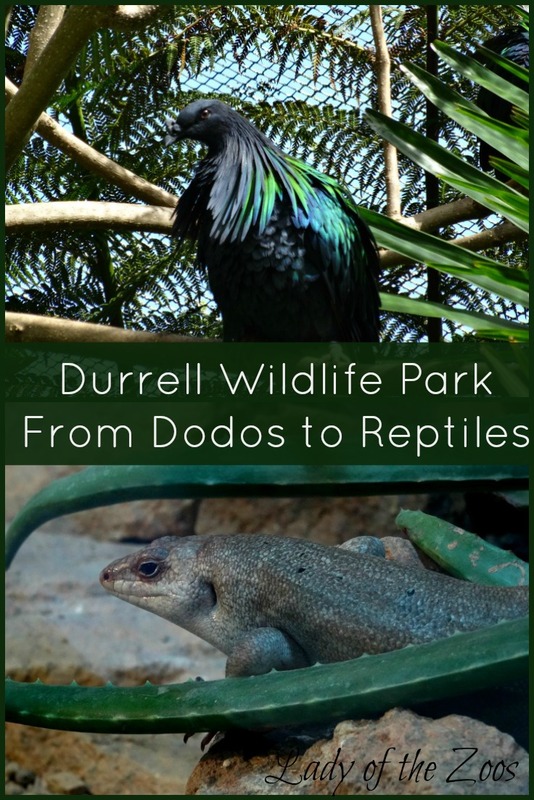 The Durrell Zoo, created in the inspiring vision of Gerald Durrell who wanted to not so much create a zoo to entertain visitors by its frolicking animals but instead wanted to create an ark to help save endangered species and also help educate the public on conservation matters and what they can do to help. This vision is driven home in Durrell’s first exhibit. A fenced in lawn with a large beautiful tree at its center, but missing its animal. Who is this exhibit for? 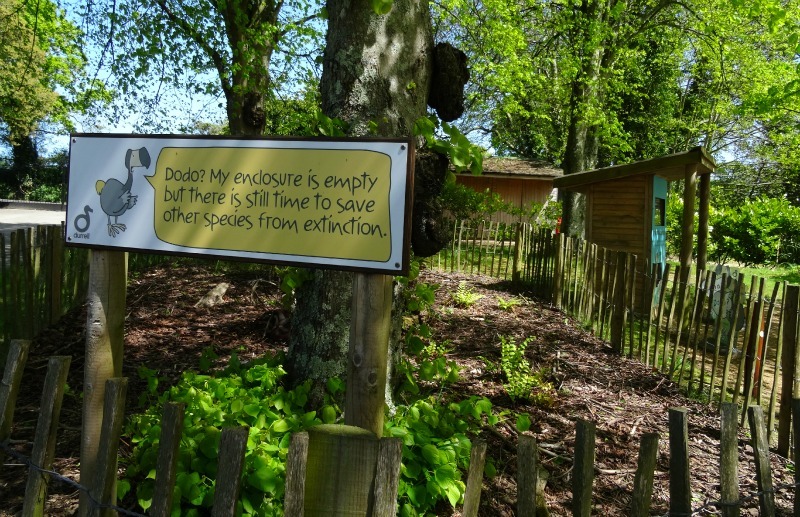 The extinct dodo bird who was hunted by man to extinction. The dodo is now the symbol of Durrell as a reminder of just how delicate our natural world is and the need to prevent further extinctions. I couldn’t help but pause a moment here and reflect. I stood and nodded my head, yes we must remember the horrible things that our species has done to others and our Earth and we must do our best to not allow our past repeat itself. One impactful exhibit followed by a fabulous multi-species exhibit which also turned out to be one of my favourites. The Cloud Forest is home to Andean bears, howler monkeys and coatis. The large outdoor multi-tiered exhibit has plenty of rocks and structures to climb to keep the bears strong and enriched, as well as a moat of water, a beautiful waterfall and of course plenty of ropes strung up for the coatis and howler monkeys to tight-rope along with the balance of their strong tails. There is also an indoor exhibit for all the animals to choose to sleep in, which is where I found them in the early morning hours. But when I came back around in the late afternoon the sweet Andean bears were lumbering around, using their strong claws to climb and waiting, as were the howlers. Around 4pm is a great time to visit the Cloud Forest as it’s feeding time, so you’ll get a chance to see everyone active and also to ask the keeper any questions you might have. 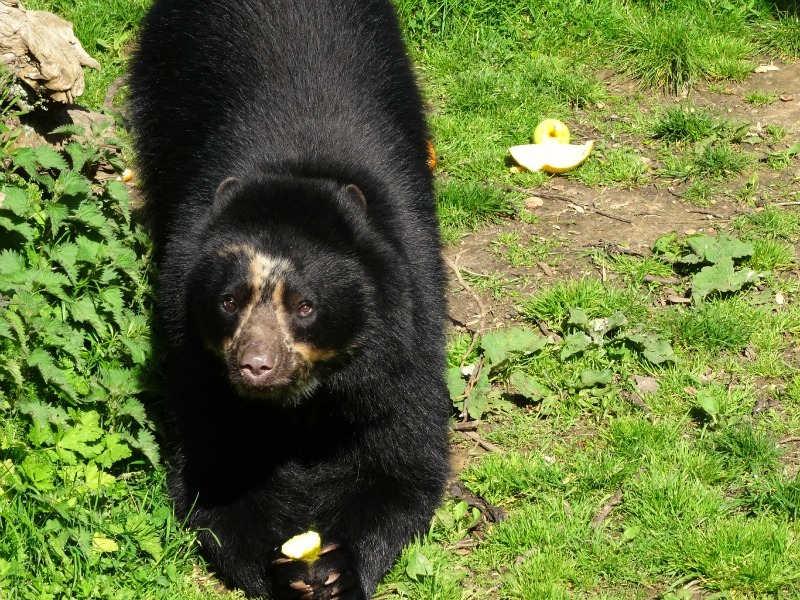 I was so smitten with those Andean bears and smiled as I watched one grasp its fruit in its front paws to eat. Andean bears, or spectacled bear for their coloured markings around their face and chest, are from South America and are the only bear species found on the continent. Also from South America is the howler monkey whose calls can be heard for miles around much like the lion’s roar. If ever there was an enchanted forest at a zoo filled with stunningly beautiful birds it is Durrell’s Jewels of the Forest. Home to various species of Asian song birds like the critically endangered blue-crowned laughingthrush, the delicate bleeding-heart dove and always a favourite of mine the nicobar pigeon. 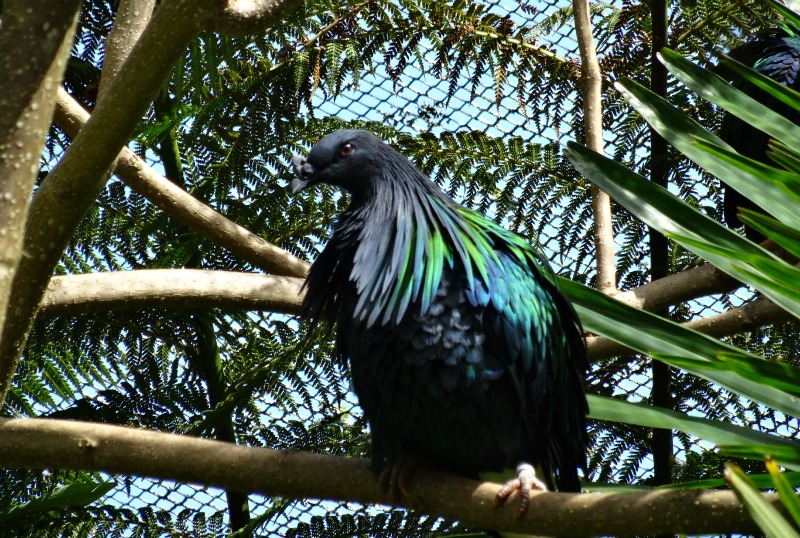 The nicobar pigeon is the closest living relative of the dodo and these beautiful birds with their iridescent feathers are a sight to see. Be sure to take time and casually saunter through the lovely Jewels of the Forest exhibit, be quiet, stop and rest on a bench and soak in the sweet sounds and try to spot all the species, from the wee pekin robins huddled in the trees to the larger birds like the elegant Palawan peacock-pheasant wandering the forest floor. Durrell Wildlife Park has various free ranging species, like the red-breasted goose, whom I watched graze on the lawns on my way to the Gaherty Reptile & Amphibian Centre. The red-breasted goose is a striking bird from across Europe, Russia and the Middle East but is sadly endangered due to diminishing habitat for roosting and feeding. But these are smart birds as they nest near birds of prey to help protect them from their mammalian predators. But here at Durrell they bred regularly and enjoy free range over the park. Home to probably one of the best varieties of endangered reptiles I’ve seen in a zoo, the Gaherty Reptile & Amphibian Centre was named after Canadian philanthropist Geoff Gaherty. The enclosures all simulate each species’ environment from rainforest to desert with some even housing multiple species. Here you’ll encounter juvenile Komodo dragons that Durrell target trains for the health and safety of the dragons and their keepers as well as for enrichment for these smart lizards. Some of the critically endangered species you’ll see are the radiated tortoise, the flat-backed spider tortoise, the Indo Chinese box turtle, Utila iguana and the Montserrat mountain chicken which turns out is a frog. The mountain chicken is a large frog and is threatened by hunting and diminishing habitat. It was the first time I’d seen these amazing frogs and was impressed when I learned of Durrell’s success in breeding them and their hopes to re-establish new populations. 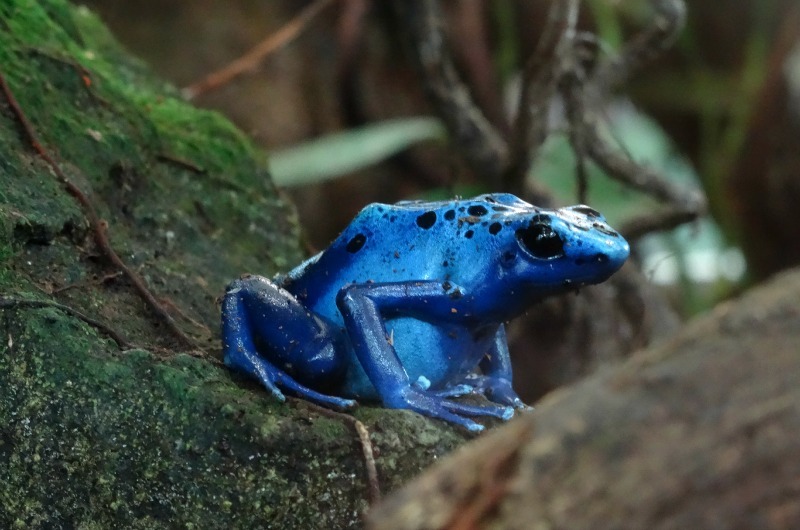 Other frogs include the poison-dart frogs of which Durrell has the golden, which is the most poisonous, the blue and the Maranon, which are two of the most endangered, as well as the smallest – the strawberry. In their lush enclosure I even spotted eggs in one of the little huts with one of the protective dad’s standing guard, as they do. During my visit I also caught one of the keepers speaking about chameleons and feeding their large panther chameleon. Seeing these gorgeous creatures move as though they’re a leaf swaying in the wind, and stretching out their massive sticky tongue to catch their prey always amazes me. A popular myth is that chameleons change their colour to help blend in with their surroundings but the truth is their colouring changing is a result of factors such as temperature, light and mood. Another new one for me was the Telfair’s skink from the island of Mauritius where Durrell focuses a lot of its conservation efforts. This seemingly non-descript skink was once prevalent but sadly when Durrell visited in the 1970’s they were restricted to Round Island due to habitat loss and introduced species. 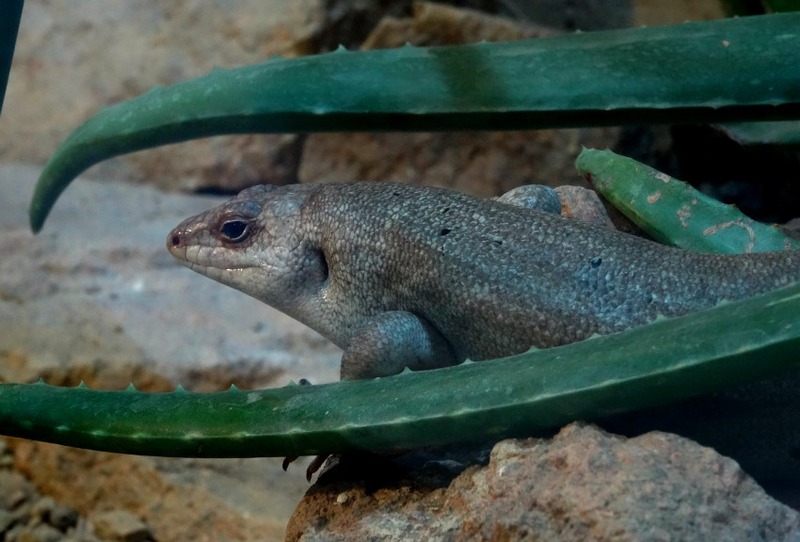 But thanks to dedicated restoration and conservation work to restore habitat and rid the islands of invasive species like goats and rabbits there is hope for the Telfair’s skink. To see more photos of my visit to Durrell Wildlife Park check out Lady of the Zoos on Facebook! Have you ever heard of the Mountain chicken?